Today, I welcome Steampunk and Fantasy author, Aiyana Jackson, to my blog. The intriguing Aiyana answers some of my questions regarding her works and the genres she writes in. Her novella, Encante was released this month and personally, it’s a book I look forward to reading! Aiyana, can you give us a little history about your writing and how you came to write steampunk and fantasy? I began writing fantasy years ago, when I was still in my very early teens, mainly I think out of a need for a creative outlet. I read a lot of fantasy and science fiction novels and also watched a lot of films and television in the same genres. I was a typical teen, basically, but socially very awkward. I had trouble making friends as I moved around a lot and (sad as it sounds) the characters in my favourite books—in particular the works of Robin Hobb—became more like friends to me than my actual peers. Consequently I grew up with a rather amusing sense of style and conversation, which a lot of people failed to understand. I immersed myself in fantastical and made up worlds and, as I got older and realised I was quite good at writing, I began to create new worlds and characters of my own. That, I think, was when I started to gain a little more confidence in myself; I stopped feeling like such a loner because I could literally create as many friends as I wanted. Once I hit college and university I soon found there were a lot of people who were like me, who enjoyed the same sort of things I did, and who actually understood what I was talking about. It was somewhat of a revelation. I never stopped writing though, in fact if anything the more I realised there were people who could understand that side of me the more I indulged it. I spend almost every spare second writing now, it’s the one thing I’m truly passionate about, and it doesn’t seem to matter what else is going on it’s always an escape. I had quite a rough time of it growing up and I think that’s what really drew me to fantasy, the escapism. Steampunk is something I first became interested in when Philip Pullman’s His Dark Materials trilogy came out. I was about twelve, I think, when I read Northern Lights and it just stuck with me. I read voraciously by that point and, as we had the internet, was also able to start looking up the aspects of novels I enjoyed and beginning to understand more about them. There wasn’t really a great deal ‘out there’ about Steampunk at that time (c.1996), or at least if there was I didn’t pick up on it. It wasn’t until my late teens I really started to understand that this was an actual genre, and not just a few cool books that had things in common. Once I did I devoured anything and everything I could find. James P. Blaylock’s Homunculus is the first thing I recall purposefully buying as ‘Steampunk’, that was when I was about sixteen. It was a while before I began writing in the genre. Unlike fantasy truly good Steampunk novels are few and far between, and so it took me considerably longer to get a real feel for it than I had Fantasy. Encante isn’t the first Steampunk story I’ve written, but there weren’t many before it, and it is the longest so far. Your novella, Encante, was released this month. Can you tell us about the novella and what inspired you to write it? It was very heavily inspired by Jules Verne’s 20,000 Leagues Under the Sea. I’ve always been a fan of the classic authors like Verne and H.G. Wells, but again they were stories I never thought of as Steampunk when I first read them, as that was in the time before I knew Steampunk existed. I began writing it after a friend of mine, who runs Kristell Ink Publishing invited me to write a piece for their first anthology, which was to be Steampunk. I was delighted, and set to it immediately. At the time I’d just bought the beautiful Barnes and Noble leather-bound edition of the complete works of Verne and was half way through re-reading them. The notion of a hollow earth has always fascinated me, and I have also always had a great love of mermaids, in their various guises, including of course the Hans Christian Anderson tale. I decided to explore both notions in a single story. The concept however, ran away from me a little (a problem I often have) and the story ended up being far too long to be included in the anthology. I was given the option of cutting it down, but it would have meant losing about fifteen thousand words out of what was then a twenty-five thousand word story, and I just couldn’t bring myself to do it. Instead it was shelved. I had been working on a steampunk novel before being asked to participate in the anthology and, coincidentally, both story-worlds utilised portal devices which were relatively similar. I decided to tweak the original short slightly and expand upon it some more, so that I could include it, and its characters, in the world of the novel. Is Encante a part of a series or is it a standalone work? Encante is the first in a series called The Fifteen Solars. At present there are four planned novellas and at least one novel in this series. The novel, Soul of Avarice, was actually the first to be written, but the world in which it is set is extremely complicated, involving a very large cast of characters all with their own unique and very interesting backstories. Rather than have pages and pages of long exposition to explain this, I decided to write a few separate, but overlapping, shorter novels which introduced various worlds and characters in the story-universe. Soul of Avarice itself is still nowhere near finished and already a very long novel, so I suspect it will be split into two, or possibly even three, making a trilogy. As a lot of steampunk novels have elements of magic/machinery/science in a Victorian-style era, was there a lot of research involved in respects to writing Encante? In some respects yes. In others, not nearly as much as you would expect. I think I actually spent more time researching submarines and the various practicalities and realities of life aboard them than I did anything else. Obviously, the Narwhal (the submarine in Encante) is a fantasy submarine, and as such it isn’t written as accurately as it would have been were I writing historical fiction, I still wanted to ensure I got the basics of life aboard a submersible correct. The one notion that really fascinated me, and became quite pivotal to the plot, was the fact that a sub could take on only so much air and would therefore be able to dive for a finite amount of time before needing to re-surface and take on more, rather like a whale. There were many other aspects of the plot that required some research, but due to the amount of novels I’ve read myself in this genre, and the fact that I have an interest in history also, I didn’t actually need to do a vast amount of research, as I’d already read a lot on the era. There are certain things you find you have to check while writing, odd things, like the correct word for a certain item of clothing, or how they referred to a sofa. The one thing I did do a lot of research on was language and slang, as I wanted to give them a relatively accurate manner of speech for the time. Are there any authors in particular you find have inspired or influenced your own writing? Robin Hobb is, without doubt, the greatest influence on my own work. I am a huge fan of her work and have read all her books countless times. China Mieville is another great inspiration to me, although I’m not sure he has necessarily influenced my style of writing so much. I think it is likely that people have had far more influence on me than I realise, and it would take someone else reading my work to say ‘yes, you can tell she’s read such a person’. Philip Pullman, Neil Gaiman and of course Terry Pratchett had a large hand in the way I think about fiction, and there are a score of other authors I admire and respect who probably deserve mention too. I write almost exclusively in the first person and that, I believe, is a direct result of Robin Hobb’s Farseer books, which are written in the first person, and the extent to which I fell in love with Fitz, the main character. That way of writing, that manner of totally immersing your reader in your character to the point where you almost feel as if you are that character yourself, was something I tried to emulate from a very early age. What are some of your favourite novels? Can you tell us why you love them so much? My favourite novels of all time are, without doubt, Robin Hobb’s Farseer Trilogy and Tawny Man Trilogy. I love the Liveship Traders books and Rain Wild Chronicles too, but the books about Fitz and the Fool have been my favourites since I was sixteen. I re-read them all at least once a year and I was beyond delighted when she announced she was writing a third trilogy about those characters, as it was always a story left unfinished, I suspect because she always had the final series in mind. I believe the reason I love these books so much is because you come to know Fitz so well that you love him, you truly understand him, and yet he is a very damaged, very flawed character. He makes a lot of questionable decisions and does a lot of things you’re not quite sure sit right on your conscience, yet you know he did the right thing, because there was no other thing he could have done in that situation. It takes phenomenal skill to write like that. It takes a tremendous character and a perfectly constructed world to allow such a feeling to take over you as you read. I will never get tired of reading those books. Can you give us a brief on what you are currently working on? What are your works-in-progress about? Oh, there are so many! The main one at present is a short story I’m working on for a forthcoming anthology, All The Night-Tide. The concept for the anthology was to base each of the stories on a poem by Edgar Allan Poe but transform it into a Steampunk story. I’m really enjoying writing it, but at present haven’t quite found its title. I’m almost finished on the final draft of Honour, the next novella in The Fifteen Solars series and I’m also working on books three and four, as well as Soul of Avarice. Those are all steampunk titles, however I do also have a fantasy novel in the works, in the early stages at the moment, called Briar. That’s a strange one to try and explain because the entire concept came to me from a photograph. I’m a huge fan of the photographer Kirsty Mitchell (http://www.kirstymitchellphotography.com/), and when her Wonderland series first came out, I was looking through all the wonderful pieces and there was this one image that just jumped up at me. I’m not sure what it was about it, as they’re all stunning photographs, but there’s something about this one that really captured my every possible sense and filled me with this whole world of possibilities. I’ve never had that happen with a book before, it’s always started with an idea and then I’ve built it up from there, but this one, it was just WHAM, fully former book in my head just from looking at this photograph. Honour and the remaining two novellas will be out next year, while Soul of Avarice (or more likely the first part of Soul of Avarice) will be out in 2015. As far as Briar goes, I’m afraid I have no idea when you can expect to see that yet. And finally, for anyone who is interested in writing, have you any advice for them? Is there anything in your experience that you’ve found invaluable and might be of help to others? I think it’s important not to underestimate the need for feedback. A lot of people start writing and keep it all to themselves because they either don’t have confidence in it, or they think it’s already great and they don’t need hear other people’s opinions. I say the opposite is true, you should get as many opinions as you can, from as many different people as you can. Make sure you keep an open mind to their feedback. Some will be helpful, some won’t, and some will be worth its weight in gold. Never get annoyed with people for their opinion, even if their opinion is that your story is terrible: it’s their opinion, they’re entitled to it. It doesn’t necessarily mean your story is bad, it may mean it just wasn’t to that person’s taste. It may also mean it needs a lot of work. If it’s the latter, don’t give up. The thing we forget, when reading all these wonderful books we buy in WHSmiths and Waterstones, is that we never read the first draft of them. We read the final, drafted, re-drafted a few hundred times more, edited, polished, re-edited, proofed version. If we read the first draft, we’d be asking for our money back. That is true of almost all authors, even the best. Develop a hide like an alligator, or a rhinoceros, something with very thick skin, and resign yourself to the fact that you will have to draft, and redraft, and continue to do this for a very long time before anything is even remotely good enough to consider submitting it to agents or publishers. This is a mistake a lot of people make, and it’s a bad one. They submit something that is essentially a first draft, and get nothing but form rejections and very bad feedback. Even good drafts get rejected 90% of the time. Don’t shoot yourself in the foot! Many thanks to Aiyana for coming ‘on board’ and sharing her thoughts about writing and her works, and for the snippets of advice and wisdom for authors hoping to follow their dream of being an author. For more information about Aiyana and her novella, follow the links below. Deep under the ocean, Simeon Escher, protégé to the leader of the order of Loth Lörion, finds himself an unexpected guest aboard the submersible, Narwhal. Home to a crew of humans, and strange mer-folk few people are aware exist, Simeon is swept up in their quest to find a world within a world, a possible safe haven from the insidious reach of the Kabbalah. Yet how can he think about his mission when the captain’s niece fills his every thought, distracting him from all that’s important to him, including his own fiancé. Encante is the first in a new Steampunk series, set in a multiverse known as The Fifteen Solars. For those of you who don’t know what a multiverse is, put simply it is a Universe in which there are several worlds existing in the same point in space and time, but they run parallel to each other. Philip Pullman’s His Dark Materials trilogy is probably the most well recognised example. The Fifteen Solars is so named due to the fact there are fifteen planets existing in parallel, each very different from the next, but all connected. The inhabitants of these worlds have not yet mastered space travel, and so for the most part the adventure is contained to their own respective worlds. They do however have the means to travel from one parallel world to the next and, consequently, the events and politics of all fifteen planets have become intertwined. As the series unfolds however it will become clear that there is far more at work, and the reasons for these worlds existing as they do is much more complex than simple happenstance. Encante serves as an introduction to one of these parallel worlds, as well as offering more than a few hints as to what is happening in the wider multiverse, and how the series will unfold. It is a self-contained story in the most traditional Steampunk style, heavily inspired by Jules Vernes’ 20,000 Leagues Under The Sea, it is a blending of mermaid folk-lore, Victorian-esque costume values, and the technological quirks that make the Steampunk genre so beloved. It is a tale of romance, of adventure, and of prejudicial values in a seemingly idyllic society. Some of the characters will recur in later books in the series. There are currently three additional novellas planned to follow Encante, two to be released in 2014, the final to follow in 2015. There will also be at least one full length novel following these. The second novella, Honour, is currently slated for release at the end of March next year, and while the additional two novellas are as yet untitled, I can reveal that the novel shall be titled Soul of Avarice. To mark the fact that I have a book published and that I’m still in a celebratory mode, I am running a GIVEAWAY on Goodreads! Three signed copies of my fantasy novel, The Reluctant Prophet, are available for three lucky readers! The competition is running until the 8th of December, which I hope gives me plenty of time to get the books posted out the to winners before Christmas. It might be a nice read if you happen to have some time off over the holidays. To whet your appetite, I’ve posted the blurb below and links to the Giveaway on the Goodreads site. Good Luck everyone! An excerpt from Susan Finlay’s mystery novel, In the Shadows. Today, I welcome Elizabeth Hull, otherwise known by the pen-name, C.N. 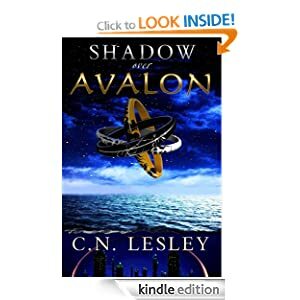 Lesley, fantasy and sci-fi author whose new book, Shadow over Avalon was released at Halloween. I’ve been fortunate enough to read Elizabeth’s first novel, Darkspire Reaches and I am excited to have her here on my blog to talk about her craft and works. Thanks Elizabeth for taking the time to answer some of my questions. Can you tell us a little bit about your writing history and how you came to be interested in the genre you write? I suppose a person writes what the read and I started off devouring fairy stories as soon as I was old enough to join a library. As for writing, I first got the bug from a very good English teacher when I was about twelve. It wasn’t all about the mechanics, it was also about the importance of things like setting and how to use words to bring this alive. I had graduated to fantasy and science fiction by sixteen and had read Frank Herbert’s Dune and J.R.R Tolkien’s Lord of the Rings. Oh, and it was all one book way back then. I still have both copies, although they are rather fragile with time and usage. Writing came later, when the kids were little and I was enduring their favourite T.V show, Barney the dinosaur. It was a reflex against brain death by Barney that made me reach for a notebook. Of course, I hadn’t a clue how to write a book and that first effort was doomed to be littered with every sin known to writers and then some I invented. I still have the typed out pages sitting in my basement somewhere and yes, it will stay dead. Learning the craft came when Del Rey set up their free online writer’s site called the Online Writing Workshop for Science Fiction and Fantasy. I stayed a member when it became independent of Del Rey and a paying site as I had so many good writer friends there. 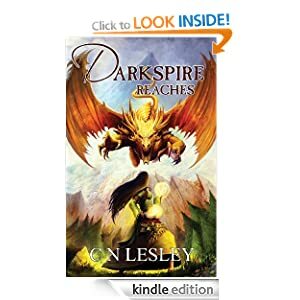 Your first novel, Darkspire Reaches was published earlier this year by Kristell Ink. Can you give a quick synopsis of the novel and how it has been working with your publisher? Synopsis? I think I would rather have a filling at the dentist office. In a few words it is about learning to accept what is and growth through adversity and love. I love working with Kristell Ink. It is so nice to be able to have an input into what my covers will be like and I love, love, love what I got. I also know I can ask questions and will get a prompt response. In other words, I am not sitting in my little corner, on my own. I am part of a wonderful team of fellow authors signed to Kristell Ink and Tenebris , which are imprints of Grimbold books. Your new novel, Shadow over Avalon takes Athurian legend and turns it on its head. When did the idea for the novel come to mind? All my stories seem to begin their lives as dreams and this was no different. It started out as a simple fantasy story and grew branches as the ideas kept coming in. I didn’t deliberately set out to write an Arthur story, or a science fantasy. This is how it developed in the process of writing. Oh, and I don’t outline as I can never stick to one. Can you tell us what the novel is about and whether you will continue it as a series? Shadow Over Avalon is about what happens when the king returns to fulfil the vow he swore on his sword to fight for his people at the time of their greatest need. In the far distant future, there is a very great need for a champion, but nothing is quite as it seems. Arthur has to fight for his own life before he can fight for his people. Yes, this is the first book of a series. Kristell Ink already has the second book, The Sword of Shadows and will publish it in 2014. The third book is more than halfway done. Was there a lot of research involved or did you use a lot of artistic license? Yes, there was a lot of pure research. I had to be familiar with the settings in the book where feasible. The Arthurian Legend is something I went right back to the earliest sources to debunk the medieval additions. I had always thought Arthur was a bigger man than to have had a relationship with his sister and I was right. This is pure artistic license from a monk dude called Geoffrey of Monmouth, who was intent on discrediting women of power in history. The original legends cite Morgan le Fey as a priestess of the old religion. Great, so now I can utilize the characters without any squinky bits smearing their characters in my mind. The science part of the book is where I have an unfair advantage as I can run them by my husband, a physicist. I also took Botany and Zoology, so genetics and embryology were subjects studied with far more intensity than if I had simply taken Biology. So yes, I do also understand about the flora and fauna of my settings and what is feasible where. Are you currently working on any other works, and if so, can you give us a little insight into what you are working on? Oh my word. Um yes. Let’s see, I am currently working on four books as I like to flitter from one to the other as the muse strikes. There is the sequel to Darkspire Reaches, which is going to be another dark fantasy. Wildenwold is an urban fantasy with an Arthurian twist. Widdershins is a cross between an urban fantasy and a paranormal romance. Greylings Deep is a fantasy set on a different world. On the backburner is book three in the Shadow series. I am not sure what the title will be, but it will feature the word ‘Chalice’. Also on the backburner is a science fiction book, set on a far distant world and in space, called ‘Angelus’. What do you do when you sit down to write, do you follow a plan or do you let the story come to you as you write? I usually go through my mail first thing in the morning. Given that I am so far west, it means that if I want a real time conversation with anyone, it has to be then. This usually involves consuming two cups of coffee. After that, I will open up Dropbox and pick the files I am going to be working with that day. Once a chapter is completed I load it on to Scrivener for the editing process to begin. I don’t start doing this until I have completed a book as things might change. Is there anything about the writing process you find difficult? Do you find you have strengths and weaknesses? In the beginning, with that first book, it was character names. As I said, the thing was a disaster and will never see the light of day, but one of the huge errs was exotic made-up names. Why? Make a name difficult to say and the reader will not remember it and get in a muddle with the introduction of other characters with peculiar names. This is called book fatigue and results in the reader’s attention wandering right out of the window. The cure is to pick easy, sensible names that suit the characters. I think I now do that. Maybe what I would consider one of my biggest assets is my memory. I can bring up the contents of any of my books in my mind so I know what has gone before as I am adding to it. This is how and why I can work on more than one book at once. For anyone out there with the dream of becoming a published author, what advice would you give them? There are fifty million people out there who all think they have written a book that is the next best thing since sliced bread. Make sure that your book is the very best it can be before you start making the rounds with it. I would suggest enrolling in a writer’s workshop, not only to hone skills, but also to develop the think skin you will need. The Online Writing Workshop for Science Fiction, Fantasy and Horror is a great place to get in depth help for a small yearly fee. I think it is just under fifty bucks. There is also Critters, which I believe is still free. I also heard that Stephen King runs his books through here under another name. I wouldn’t know for sure as I have not been on that site. I would also suggest reading a lot of books in your chosen genre. The more you read, the better you will get at the art of story crafting. It is also useful to see where the trends of theme are going and what is hot right now. Finally, keep knocking on the doors. It only takes one to open and that won’t happen if you don’t keep going. Elizabeth, thank you for taking the time to stop by and answers some of my questions! I wish you every success with your writing, and I can’t wait to finish reading Shadow Over Avalon. Thanks so much for guesting me, Gilly. It has been a blast. to ensure their own survival, no matter the cost. after being rejected by civilisation and the tribes, she must at last face him. pursued by the wyvern. Soon her life will change forever. unsettling romantic adventure about rejection and belonging. This is for a very good cause and a little bid could go a long way in helping people in the Philippines! Author Keris Stainton has organised an online appeal to raise money for the Red Cross relief efforts in the Philippines following Typhoon Haiyan, which has left thousands of people in desperate need of food, shelter and clean water. Susan’s mystery novel was released yesterday. Check out Dean’s blog post for more info. This is another book I’m looking forward to reading, especially having read parts of it before! Congratulations Susan on release of your novel! Susan, can you tell us a little bit about yourself and then explain the concept for your new mystery series?